Note: For example, ‘Il a attendu’ can mean ‘He waited’, ‘He has waited’ or ‘He did wait’. Note how the past participle does not change to agree with the subject of the verb. In other words, it makes no difference if a masculine or a feminine, singular or plural subject is performing the action! Next is a table with the conjugation of irregular verbs using “avoir”. It is the past participles that are irregular – learn these off by heart as they are extremely important. There are numerous examples of ‘avoir’ verbs in chapter 4 of Didier’s adventures. Try and find all the other ones, a total of 18! Now Try and find some irregular past participles in the story – there are plenty of them! Verbs that cannot take a direct object (intransitive verbs) are conjugated with ‘être’ in the Passé Composé. There are also a number of verbs of motion that fall into this category. In the case of ‘aller’, for example, it is obvious that you cannot ‘go’ someone in the way that you can ‘see’, ‘touch’, ‘notice’ them. This is what is meant by an intransitive verb. 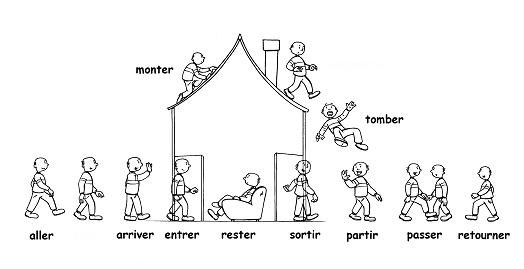 Note that certain verbs can be conjugated with ‘avoir’ or ‘être’ depending on the context: see verbs with * in the table. Can you locate ‘être’ verbs in the Passé Composé in chapter 4 of Didier’s story in this exercise? Here is one: Je suis parti. Now for something more challenging, write out a short account of what you did during the summer holidays last year. Use as many verbs as you can in the Passé Composé. Be careful of the sequence in a negative sentence. The “ne” and the “pas” are wrapped around the auxiliary verb “avoir” or “être”. As-tu écouté la radio? – Did you listen/have you listened to the radio ? Ont-ils réparé la voiture? – Have they repaired/Did they repair the car? A-t-elle rempli la bouteille? – Did she fill/Has she filled the bottle ? Note that in the last example and for the third person singular in the interrogative, you insert ‘t’ because two vowels are coming together. The ‘t’ is used to help run together the two words that start with a vowel. Nous allons ramasser ces pommes – We are going to pick these apples. In chapter 4 of the story, we come across 4 examples of demonstrative articles. Can you find them? In Unit 2, we saw Direct Object Pronouns. It is important to note now that pronouns can be direct or indirect. The following is a list of the most commonly used personal pronouns. Note that ‘me’ can mean ‘me’ or ‘to me’. The same is true of all the pronouns in the first column. Il a regardé la television – He looked at the television (direct in French). Je l’ai regardée toute la soirée – I watched it all night. Once more, there are plenty of direct and indirect object pronouns in chapter 4 of Didier’s story. J’ai pu en profiter – I was able to take advantage of it (indirect object). Ils m’ont dit – They said to me (indirect object). Je suis impatient de les voir passer – I am impatient to see them pass by. In the Passé Composé of verbs conjugated with ‘avoir’, the Past Participle agrees in number and gender with a preceding direct object. Try this game and find examples of direct and indirect object pronouns in the text.